Initialize a linear projection evaluator for state space space. The used projection matrix is sampled at random and the cell sizes are automatically inferred through sampling. 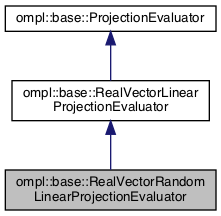 Initialize a linear projection evaluator for state space space. The used projection matrix is sampled at random to produce a space of dimension dim and the cell sizes are automatically inferred through sampling. Definition for a class computing a random linear projections. Definition at line 83 of file RealVectorStateProjections.h.